Information: There were two Gatchaman cards included in this set, however, the second one was marked as a "Gatchaman II" card. The cards were packaged in a resealable plastic bag. To see it, click here. 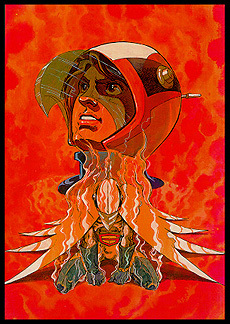 The card on this page is actually more indicative of a "Gatchaman Fighter" image, but it was marked as an original series "Gatchaman" image, so it is included here. It was illustrated by Sadao Miyamoto.